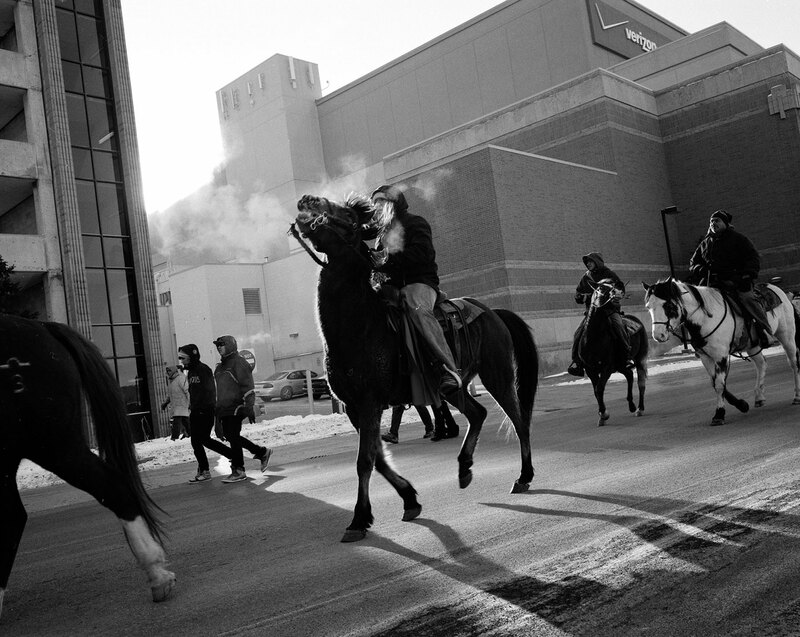 This photograph is of Sioux riders arriving in the town of Mankato, Minnesota, on the 150th anniversary of a mass hanging where thirty-six warriors were executed on a single day, the largest group hanging in American history. The hanging of the Sioux in downtown Mankato on the day after Christmas, December 26th, 1862, ended a rebellion by the Dakota, who were starving after promised provisions never arrived on the reservations. Because the Sioux attacked as many homesteads as they could, Minnesota settlers were so traumatized by the uprising that even today, it is still on the books that it is illegal for the Sioux to enter the state of Minnesota. It’s difficult to describe how cold I was when I took this picture. The people from the northern mid-west seem to be used to the freezing temperatures, but I could barely move my fingers enough to press the shutter. As I walked into town, I could hear the beautiful singing of members of the Sioux Nation, marking the occasion with songs for the dead. One woman told me that unlike the Lakota further west, the Dakota language is almost dead, there are so few speakers today.